The unique ergonomic styling of this durometer makes it the first choice for making hand held measurements. A removable knob allows the instrument to fit comfortably in your palm. An 8-32 threaded hole also enables the unit to fit in most durometer stands. These durometers meet or exceed all aspects of ASTM D2240 specifications. 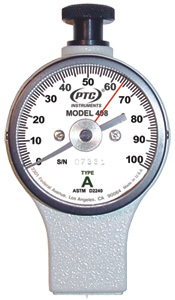 The dial scale can easily be read to 1/2 point readings. A standard Max-hold hand remains at the peak reading until reset. The durometer comes complete with test block, carrying case and a Report of Test. The included test block is made from aircraft grade aluminum and has a steel leaf spring to give a reading within ±1of its value. This test block gives much more reliable readings than rubber blocks and its readings are unaffected by normal ambient temperature and humidity.